Every day we find ourselves stuck in traffic. But help is on the way, and one of these days we’ll be in our vehicles, sailing along like speedboats across Galveston Bay. One of the biggest projects – the Texas Department of Transportation’s $311 million widening of the Gulf Freeway from 6 to 10 lanes is still more than two years from completion, but once the interchanges are built, the wider feeder roads are accessible, the new lanes are added and the work is all done, we should be able to travel the speed limit and get where we’re going without much effort. No more traffic jams at the Dixie Farm exit – just smooth sailing to and from Houston and from Houston to Galveston and back. But so you can plan ahead – the El Dorado interchange will be closed from March to August 2015, and the Bay Area Boulevard interchange will be closed from April to July 2016 with completion of construction in 2017. Help is also on the way for the area’s busiest intersection – Five Corners in League City, where FM 270 (Egret Bay Boulevard) intersects with FM 518 (Main Street) and FM 2094 (Marina Bay Drive) and hundreds of vehicles wait and wait and wait – sometimes sitting through two and possibly three red lights before they are on their way during rush hour. Or trying to make their way from South Shore Harbour when football games are played at Veterans Stadium. The road is also the only road connecting Clear Lake and League City between Highway 146 and Highway 3. League City has finalized a plan it calls the Five Corners Realignment project, which will build a road from FM 518 over to FM 270, setting aside $7.9 million for environmental approval, right-of-way purchase, and construction. The new road will cross FM 2094 and go around the corner gas station and link up with FM 270. While the State Highway 146 expansion project is needed now, TxDOT does not expect construction on the three-mile segment from Red Bluff Road through Kemah to begin until 2017. That’s how long the state agency expects it will take to draw up design plans, notify businesses that a portion of their business is needed to build the new roadway and for right-of-way acquisition. 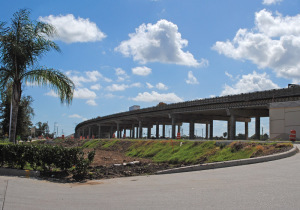 Construction of the $200 million project will take about three years and will include a second expressway bridge across Clear Creek Channel, which links Clear Lake with Galveston Bay. TxDOT said It will be built west of and parallel to the Seabrook-Kemah Bridge, which will remain and serve as a frontage road for motorists. At this point, the focus is on Union Pacific, which has been asked to sell a portion of the railroad’s right-of-way along the Seabrook Industrial Lead. Meanwhile, the City of Seabrook is working to find new homes for the businesses that will be displaced.